Have you tried Google Voice? If not, I think I can understand why. It’s one of those services that sounds a little confusing -- and perhaps not terribly useful. 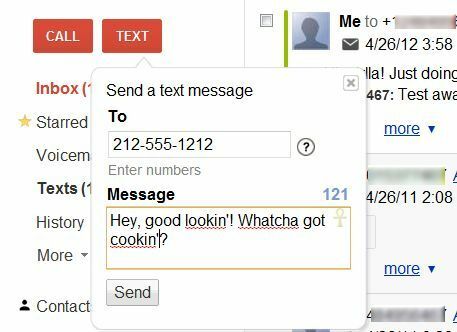 But Google Voice is a pretty cool tool, and it can solve more than a few hassles. Let’s take a look at three GV perks you might not have known about. Why bother pulling out your cell phone and typing on its tiny keyboard every time you want to send a text message? If you’re at your computer, you can simply open up Google Voice, click Text, enter the recipient’s phone number, and type your message. Click Send and you’re done. Best of all, replies will pop up right there, so you can hold an entire SMS conversation right in your Web browser. Oh, and unlike with standard texting from your phone, GV texting is free (for you, anyway -- the recipient still has to pay regular rates). Google Voice is, at its core, a voice-over-IP calling service. And a free one, at least until the end of 2012. That means you can make unlimited local and long-distance calls without spending an extra dime. Looking for a way to integrate this GV goodness with your current phone system? Check out the Obihai OBi100 adapter, which plugs right into your router (much like a MagicJack, but with Google Voice as the service provider). Connect your phone’s base station and presto: You’ve got dial tone. Are you conducting an interview? Talking to a customer-service representative? Planning some blackmail? Might be nice to have a recording of the call. Google Voice makes this a cinch: just press 4 during the call to initiate recording. When you’re done, you’ll be able to access the audio file from the GV dashboard. Just one caveat: this works only for incoming calls. And depending on your state’s laws, you may need to get consent from the other party. If you’ve found other cool things to do with Google Voice, tell me about them in the comments!